God promises that when we put our trust in Him, we will resemble trees planted by the waters. I am most certain that the tree He has in mind for me is a weeping willow. Rather than maintaining a constant plateau of rejoicing, I often find myself allowing my joy to weep out when encountering sad or disappointing circumstances. It is not as though I go around depressed all the time; I think others would attest to the fact that I try to live life upbeat and encouraging. There are just those moments when I cave towards despondency. During those hard times, I’m as weepy as a willow. However, an interesting fact about weeping willows is that although their branches do seem to weep, by cascading down, they are nevertheless remarkable for their toughness and tenacity to life. God understands our human frailty. Despite my tendency to weep when life gets rough, He uses each season of sorrow to grow me nearer to Him. Along the way, He strengthens my faith and toughens me for the next time hardship hits. He builds in me tenacity for the storms. Do you ever grow despondent during of the trials of life? God created us with emotions, and He understands there will be seasons of weeping. Rather than beat yourself up because you sometimes let things get you down, rejoice knowing that God can use your sorrow to strengthen your dependency upon Him. God can turn a weeping heart into a steadfast willow of trust. 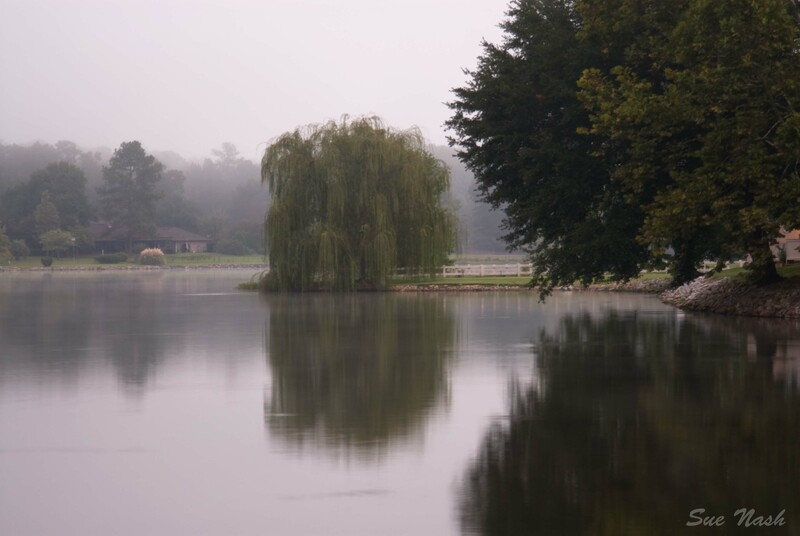 This entry was posted in From His Heart and tagged Christianity, encouragement, fog, God, photgraphy, sad, Tree, Weeping Willow on October 17, 2013 by heavenlyraindrops. Thanks and blessings on your day! Beautiful Sue. From another ‘Weepy Willow’. So good! God uses every season to build us and help us become more like Him and often times it is the “weeping” seasons we learn from the most. I can’t say anything about your post this evening. don’t know why really touching my heart and mind. I am going to print this out, sis. May I ? Thank you for your great post. Blessing on your day. “Weeping may endure for the night, but joy comes in the morning.” That joy comes to those who weep in hope; those who weep in expectation. Jesus said “Blessed are you when they revile and persecute you, and say all kinds of evil against you falsely for My sake. Rejoice and be exceedingly glad, for great is your reward in heaven…….” Matthew 5:11-12. The Lord Jesus uses this scripture to assure us that there is triumph at the end of every trial. Trials and tough times produce toughness in those who are able to withstand. May the Lord grant us the strength to stand in times of trials and hope in times of weeping, knowing that He is ever faithful. He will never leave nor forsake His children. God bless you for sharing! Thanks so much for your wonderful input and reminder Elizabeth. Blessings friend. Beautiful. Reminds me of this: Revelation 21:4: ‘He will wipe every tear from their eyes. There will be no more death’ or mourning or crying or pain, for the old order of things has passed away.” Blessings to you! Sue, I have been there more than once. Looking back it they were times of almost total reliance upon Him. It’s interesting that Spurgeon often went into depression. The Lord is our comfort particularly in those times. It makes Heaven a sweeter place to look forward too. Blessing to you!!! Amen. God brings that comfort and hope when needed. So looking forward to our heavenly home! Thanks! Reblogged this on The Joy of Believing. good read Sue….the Chinese say that it is better to be a willow than an oak tree, because an oak tree can break in a heavy storm even though it boasts of being strong…but I love to watch a willow in a storm…they don’t break…they shed a few excess branches, but they rarely lose a limb! It’s like they admit they are not the strongest tree around and in doing so, they learn to move with the storm. and in that way, they are much stronger than an oak! Thanks for stopping by my blog and God bless! You are welcome. Sorry so slow to respond back, but I have been slowly recovering from surgery. Blessings your way! how has the recovery been going? I have been praying you through it! God bless!